‘Hair Science and Technology’ (Editor Dominique Van Neste MD PhD. The Society has been recently invited to review this remarkable volume. It has been a prime focus of interest among our members and students. The book’s 470 + pages include abstracts, functional studies, case histories, photographs, data tables and references associated with current hair research. In this era of scientific interest in hair and its problems, the work presents a fascinating and unequalled insight into the extensive research currently in progress. The volume is a must for every student/trichologist/hairscientist. 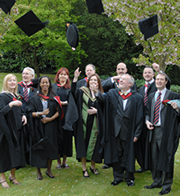 The President’s Day / Graduation Day is held on the 2nd or 3rd Monday of May at Hunton Park, Essex Lane, Hunton Bridge, Hertfordshire WD4 8PN, with ceremonial presentation of diplomas. All members are encouraged to attend this celebration event. As there are lectures presented on that day, all UK students are required to attend. The Society has its own academic colours Red/White/Black. Members, Licentiates, Fellows Patrons and Guests may hire or purchase appropriate items of academic clothing through Messrs Ede & Ravenscroft. Please refer to the Registrar. Insurance: Professional Liability Insurance is mandatory for Licentiates (Trichology practitioner members) of The Society – Please contact the Registrar for details of good value policies. The following specialists/services are available to members e.g. * The Society offers a platform through which knowledge and bone-fide ideas may be shared for the benefit of all. * The Society encourages its graduate trichologists (Licentiates) to inaugurate clinical practices. It will advise accordingly. * Web Design Web sites can be designed and managed at preferential rates for members by Elite Solutions. Members and Licentiate/Fellow Practitioners may request that their names be included on the Society’s listings as appropriate, and have their webpage linked to The Society’s website from which referrals may derive. The grant of this facility which is subject to continuous review, commits the member, or licentiate/fellow practitioner to a faithful and absolute observance of The Society’s guidelines. Only practitioners offering the highest professional standards consistent with the ‘aims of the Society’ can be represented on the Society’s website. The Society recommends voluntary radius controls to eliminate counter-productivity resulting from too many specialist practitioners operating in a particular area. Functions: The Society hosts a President’s Day and Graduation Day in Greater London annually in early May.